Illinois Tool Works Inc. (ITW) manufactures and sells industrial products and equipment worldwide. It operates through seven segments: Automotive OEM; Food Equipment; Test & Measurement and Electronics; Welding; Polymers & Fluids; Construction Products; and Specialty Products. 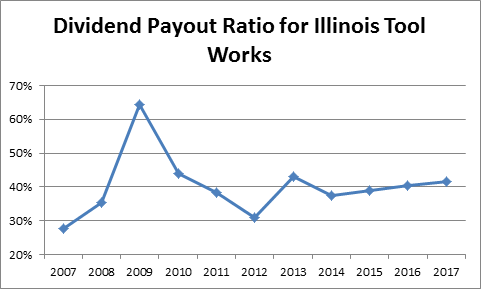 Illinois Tool Works is a dividend champion with a 44 year track record of annual dividend increases. Back in August, the company’s Board of Directors authorized a 28 percent increase in the dividend payout to shareholders. This brought the quarterly dividend to $1/share. This action brought the stock to my radar. The company has a ten year dividend growth rate of 11.60%/annum. Rather than pursue lower-return, higher-risk opportunities that reside outside of the company’s core strengths and capabilities management has chosen to return surplus capital to its shareholders. This is the type of return focused and shareholder friendly management I like to see. The Board also approved a new share repurchase program that authorizes management to buy back up to $3 billion of the company’s common stock over an open-ended period of time. The full authorization represents approximately 22 million shares, or 6% of shares outstanding. Over the past decade, the company has managed to increase earnings from $3.28/share in 2007 to $6.56/share in 2017. The 2017 earnings per share amounts were adjusted for $1.70/share charge related to the new tax law. 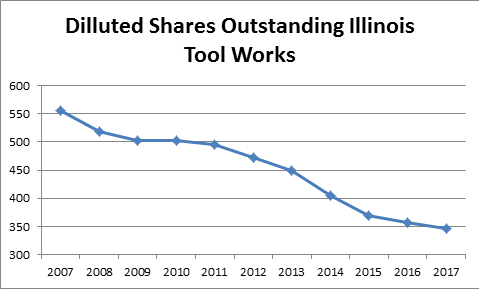 Illinois Tool works is expecting to earn somewhere between $7.50/share to $7.70/share in 2018. The company is in the middle of a restructuring that started in 2013. The goal was to simplify the business structure, narrow the focus and improve the quality of the portfolio, and ultimately focus on organic growth rather than growth through acquisitions. By simplifying and shedding areas that are more commoditified, the company has been able to boost profit margins. This realignment has been helpful in driving organic growth by focusing on most profitable segments, while simultaneously reducing the cost structure. ITW has an 80/20 process, where it focuses on the 20 percent of its customers that generate 80 percent of its revenues and structures the business around serving and growing relationships with these key customers. The efficiencies gained from 80/20 deliver best-in-class operating margins, strong free operating cash flow and differentiated returns on invested capital. The company’s innovation efforts are “80/20-enabled” as its businesses focus on building relationships with major customers to develop deep knowledge and insight around their key needs and pain points. This customer innovation approach has resulted in a large amount of patents, which further bolster the company’s competitive position. 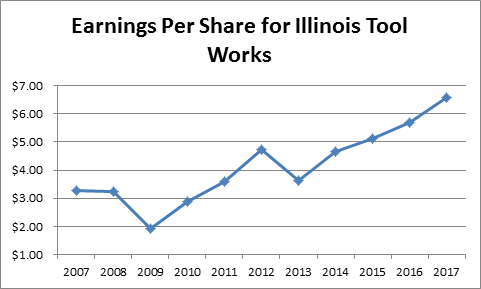 Illinois Tool Works operates through 84 divisions in 57 countries in a highly decentralized structure that places responsibility on managers at the lowest level possible, in an attempt to focus each business unit on the needs of particular customers. Each business unit manager is held strictly accountable for the results of his or her individual business. The company is targeting 3% – 5% organic revenue growth and 8% - 10% earnings growth through 2022, by leveraging the ITW business model outlined above. The risks to ITW include the relative cyclicality in the businesses it serves. Another risk includes the fact that the company invests less than 3% of revenues on research & development, which is several times lower than competitors. The company may claim that it is only investing in areas where it can create value however, and that this low R&D investment is due to its laser sharp focus on providing value in its customer centric approach to innovation. The dividend payout ratio increased from 28% in 2007 to 42% in 2017. The forward dividend payout ratio is at 53%. The dividend is safe based on the history of earnings growth and the dividend payout ratio. Currently, the stock is fully valued at 18.90 times forward earnings, which is at the top of what I am willing to pay for a cyclical company. The stock yields 2.80%.